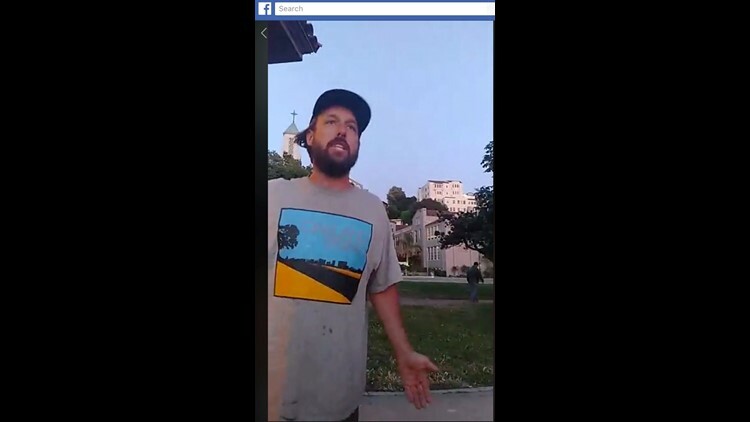 A Facebook live video posted Saturday shows a man allegedly seen at Lake Merritt park in Oakland, California, on Saturday. A jogger filmed dismantling a homeless man's encampment at an Oakland, California, park was apparently arrested after returning to the scene of the incident and getting caught on camera — again. Henry Sintay, 30, was arrested Monday on suspicion of robbery by Oakland police, area station KTVU reported, with authorities claiming Sintay stole the phone of a bystander who filmed him after he arrived Saturday to the lakeside park where the homeless man's camp was destroyed the day prior. "Is this that same dude?" asked Matt Nelson, the bystander, in a Facebook livestream on Saturday. Footage appears to show the jogger who allegedly threw a homeless man's belongings in Lake Merritt. He wades in the waters to retrieve soaked items, introducing himself as "Henry." "Why am I getting in the lake to pick it up? Because was trying to do the f----- right thing," he says. "I don't like to pollute the lake. Do you?" He asks if he's being filmed, then grabs the camera. A struggle ensues as the camera spins wildly. "I'm being attacked!" a voice screams. Then the sound of running footsteps. The man alleged to be Sintay, now holding the phone, yells to someone off camera: "Run, dude! Full speed. Run!" As of Tuesday, Sintay remained held at Santa Rita Jail in Dublin, California, on $100,000 bail, SFGate reported, with a court appearance set for Wednesday. Bystanders on Friday evening pleaded for the jogger to stop upending the encampment of a homeless man identified as Greg Markson, who told KPIX 5 he had lived at the lake "off and on" for over a year. Locals later delivered new items to Markson, the station reported.